The day commemorated as the victory day of "Dharma" (virtue) upon "Adharma" (evil) according to the old history of Bali (Purana). This day the Hindus give thanks to their gods and feel grateful for His blessing and for the creation of the earth and its contents. This victory day is celebrated every six months (6x35 days=210 days), which is called Galungan Day. It is called Galungan, probably because it is celebrated on wuku Galungan (based on the Balinese calendar), and so does Kuningan Day that falls on wuku Kuningan. This day is the day of rituals, festivities and celebrations with "Penjor" the artistically decorated bamboo-pole stuck at every house entrance, adorning the both sides of the village-roads symbolizing of prosperity. On this day, people begin to prepare the necessities for the Galungan ceremony. They collect fruits and store them in a special place until they get ripe. On Penyajahan day, people keep on maintaining awareness, patience and the purity of the soul in order to control the demons. Another meaning of Penyajahan is making or cooking Balinese cakes (jajan). Therefore, on this day, people have to cook various kinds of Balinese cakes for the ceremony to come. This is a sacrificial day. This is the day to slaughter sacrificial animals like chickens, ducks or pigs. People cook them into various kinds of Balinese food, such as satay, soup, lawar (a special Balinese food made of meat or vegetables, mixed with coconut sauce).While the women continue to be kept busy with the preparations of the many offerings to be made at the temple on the day of Galungan, men also prepare a long bamboo pole, or 'penjor', is made to decorate the entrance to the family compound. 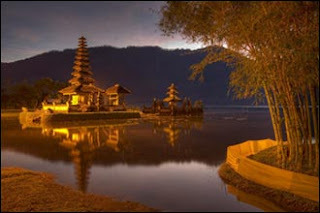 By late all over Bali the visitor can see these decorative poles creating a very festive atmosphere along the streets. On the Galungan day itself, Balinese Hindus go to temples and other holy places to pray. People are dressed in colorful Balinese costumes. They carry the offerings for their God. On this day, Balinese Hindu communities usually visit their relatives, friends and neighbors. They forgive each other and remain together. It is also a day to relax and visit places of interest, after the long days of preparations for the celebration. "The connection between Mayadenawa and Galungan Day"
Once upon a time, there lived a powerful King called Mayadenawa. Mayadenawa was a descendant of daitya (powerful giant), the son of Dewi Danu. Because of his power he was able to transform himself into many kinds of creatures and forms. This King ruled over the areas of Makasar, Sumbawa, Bugis, Lombok, and Blambangan. Because of his great power, Mayadenawa became snobbish and cruel. During this period a priest with divine power, called Mpu Kulputih. Mayadenawa did not allow the Balinese to worship gods, and he destroyed all the temples. Because of this the people of Bali became desperate, the plants were destroyed, plaque was everywhere. The people did not dare to fight back or argue the order of Mayadenawa because of his magical power. Mpu Kulputih was so sad to see this condition. Then he meditated at Pura Besakih to ask for the God's guidance to handle the chaos within Bali society caused by the King's behavior. Then he got guidance from the god Mahadewa to go to Jambu Dwipa (India) and ask for help. It is not clear about who was finally sent to India, and how was it until a platoon of troops from heaven came to attack Mayadenawa. It was said that the God Indra led the troops from heaven, with complete weapons to Bali. In that attack Citrasena and Citragada led the platoon in the right wing. Sang Jayantaka led the left wing, whereas Gandarwa led the main platoon. Bhagawan Narada was sent to investigate Mayadenawa's palace. Mayadenawa has known the attack from the troop of Bhatara Indra, because he had many spies. Therefore, he prepared his troop to face the attack from the troops of heaven. A war cannot be avoided, a dreadful war that caused many victims from the both side. But, because the troop of Bhatara indra was stronger, finally Mayadenawa's troops fled and left the King and his assistance, who is called Si Kala Wong. Good luck was with Mayadenawa and his assistance because the war had to be stopped, because the night has come. At night, when the troops from heaven were still asleep, Mayadenawa came and created water with poison in it near the beds of the troops from heaven. Then, he left that place, and in order not left any trail, he walked with the sides of his feet. That place later is called Tampak Siring. The next day the troop from heaven woke up from their sleep and drank the water that has been created by Mayadenawa. All of the members of the troops became sick. Bhatara Indra found out about this, then he created another source of water called 'Tirta Empul'. Because of this source of water, the sick troops became well. The flow of the water from Tirta Empul became a river called Tukad Pakerisan. Bhatara Indra and his troop chased Mayadenawa who had run away with his assistance. In his flight Mayadenawa transformed himself into 'manuk raya' (a big bird). This place later is known as Manukaya village. Mayadenawa could not trick the powerful Bhatara Indra. Mayadenawa transformed himself several times into 'buah timbul', 'busung', 'susuh', 'bidadari' and finally turned himself into a stone called Si Kala Wong. Bhatara Indra shoots it with an arrow till he died. His blood kept on flowing and became a river called Petanu. This river is cursed. If it used to water the rice field, the rice paddies would grow rapidly, but when harvested blood would came out of it and smell bad. This cursed will end in 1000 years. The village where Mayadenawa transformed himself into 'timbul' fruit, later is known as Timbul village, the place where he transformed into 'busung' (young coconut leaf) is called Blusung village, the place where he transformed himself into susuh is called Penyusuhan village, and the place where he transformed into a fairy, later is called Kedewatan village (Ubud). The death of the King Mayadenawa is the victory of the good (dharma) upon evil (adharma). This victory day is celebrated every six months (6x35 days=210 days), which is called Galungan Day. It is called Galungan, probably because it is celebrated on wuku Galungan (based on the Balinese calendar), and so does Kuningan Day that falls on wuku Kuningan. The celebration of Galungan dan Kuningan is started on Tumpek Wariga or Tumpek Pengarah, the preparation for Galungan and Kuningan, until Budha Keliwon Pahang or is also called Budha Keliwon Pegat Wakan.